The kitchen is usually the hub of the house. My Granny’s kitchen was no different. 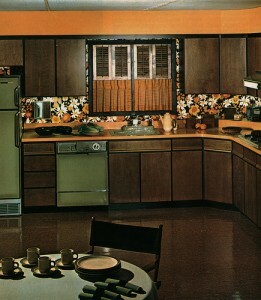 Her house was built in late 60s/early 70s and the was kitchen was lovingly decorated in avocado green. I loved that kitchen. In the evenings, the dishes were washed and the lights turned low. My Granny would roast a pan of peanuts, pour a glass of ice-water, and complete her daily crossword puzzle. Sitting quietly talking with my mother while she worked are some of my best memories. The challenge for Day 11 – Write a list poem. Check out my favorite day of the challenge so far here.